I am just back from holidays in Finland and have great news to report! My menses came on day 28 but there was minimal pain! The menses started in the evening, with slight discomfort and pain in the belly. However, I slept through the night with no pain at all, whereas usually I would have woken up because of the pain, unless I was using grounding sheets. I didn't have grounding sheets this time. When I got up, I first went for a swim in the cold sea, and then had some breakfast and drank angelica tea. The pain started as I got up but angelica tea seemed to lessen it a bit. Summary of this diet diary is provided here. I then went on a walk in the forest with my boyfriend and as I was walking briskly the pain would not be too bad, but stopping for a longer time would start to bring it back. As long as I kept walking I felt quite well. When back indoors, I drank angelica tea here and there but was not taking any other supplements than Limcomin and Paramin. After half a day there was no menstrual pain left at all! So in total, it was very easy to get through the beginning of the menses. There was no need for pain killers, and no need to lie down. These are the big results of the hormone diet to report in this part 4 of the diary, but below I will give some additional information and try to understand why my menstrual pain seems to be history. I just hope it won't come back next month, and will keep reporting. I flew to Finland and managed to get through the journey without buying anything at the airport or on the airplane. I packed some solid foods and bought some sugar-free "Bounce" protein balls to take with me as well. 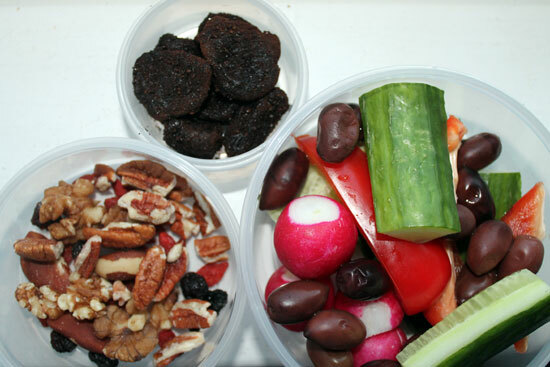 My travel snacks for the airplane journey: Prunes rolled in licorice powder; a mixture of nuts, raisins and goji berries; and vegetables with black olives. The above travel snacks worked well although I should have taken more nuts and kept the vegetables whole. I could have carried a plastic knife and taken big pieces of washed cucumber, radishes, and a full red pepper. The problem this time was that the cut vegetables started perspiring water and also didn't stay too fresh-looking too long, so when you open the container you have slightly soggy vegetables with water at the bottom - not very appetising! I also had a container with fried potatoes mixed with spices, very little oil and some mushrooms. You have to minimise sauces and oils because they are not allowed across the airport security checks. I carried lots of water as well but had to make sure to drink it all before the security, as you can't bring liquids through. I then had to buy bottled water on the other side before getting on the plane. So the whole trip went very well and I didn't feel hungry or have any need to buy food. I saved a lot of money too since the airport meals seem to be at least double compared to the prices elsewhere. Once in Helsinki we ate out - Chinese food - and slept early, tired after the trip. Weight when returning from the trip: 56kg on the day of the flight back (water retention due to dehydration); 55kg on the day after. While in Finland I swam in the cold sea almost every day, sometimes from sauna and sometimes just upon waking up. The sea water was approximately 10 degrees Celsius, which is cold enough to hurt your legs as you wade in the water. The trick, then, is to get in and get out very quickly. And the point of doing this is that you feel very awake and good afterwards, your body feels relaxed and full of vitality. But it is very important to get properly dry and warm quickly after the swim, which can mean wearing a lot more clothes than you would otherwise for a little while. You only feel cold as you go in and come out of the water, but then you can stand outside in your towel in the cold air but actually feel very warm. For a limited time only, of course. Swimming in the sea also effectively grounds you. I also walked quite a bit in the pine forest, which is meant to have some of the cleanest and best quality air in the world. Perhaps these things contributed to the success of balancing my hormones. In terms of eating, I ate lots of fish, smoked and otherwise, and plenty of good vegetarian food made by my mum and dad. This included vegetarian cabbage burgers, mushroom soup, grilled potatoes, root vegetables and soya sausages, fresh berries, many salads, smoothies, potato bread, fishcakes, blueberry pie, oven cheese, etc. Also my boyfriend cooked some curry with plenty of onions and we ate it with white rice. For breakfast I had mostly bread, and once tried to have yoghurt but my nose got blocked the same night so I gave that a rest. Generally I ate a lot of rice pies (Karelian pies) and too much cheese. I also ate out a few times and had some beers here and there, but not very much. I also had a few sweets on some of the days because I love Finnish sweets! I drank tap water and some juice and was a bit sleep deprived on some of the days, but generally slept very well. So mostly I was eating fresh wholefoods but of course the diet was still too high on carbohydrates, mainly because of bread. I noticed again that when I ate sugar (blueberry pie), my face went red a little time after. Most of the time I managed to completely avoid sugar, however. On day 28 of the menstrual cycle I got my menses, and if you read the beginning of this article you will have a general account of how the day went. There was only half a day of moderate pain (on and off) and then no problems. This is a huge achievement and I am extremely happy about it! - Another five-day green juice fast. - Mostly drank live spring water. - Took Limcomin and Paramin supplements. - Probiotic capsules and some water kefir. - Some other supplements but phasing out towards the end of the cycle. - Avoided sugar quite well. - Angelica herbal tea, especially during menstruation. - Hormone-balancing yoga and walks in nature, not every day. - Have been eating some organic nuts (pecan, walnut, Brazil) almost every day. It seems that organic nuts (from Tree Harvest) don't cause mucus the same way as non-organic ones do. - Took some superfoods on and off, including kelp. Maca and dandelion greens were regularly included in smoothies but not every day. - Had pink Himalayan salt instead of normal table salt with most meals. - I ate a usual amount of fat, didn't try to limit it. - Drank herbal teas regularly, such as chaga mushroom, red clover, rosemary, Siberian ginseng, dandelion, reishi, schizandra berry, hibiscus, etc. - Tried to ensure protein on most meals, e.g. spirulina, nuts, fish, eggs, beans, etc. - Ate only partly organic. For one month, after coming back from holidays, I didn't follow the diet too carefully. I ran out of spring water and I didn't do another juice fast. I kept taking Limcomin and Paramin supplements, however. I ate semi-healthy, staying away from processed carbs but not as carefully as before, and more than 50% cooked foods I would say. The end result was that the last menses were worse again, and the cramps came back. They didn't come back quite as powerfully before, but enough to have me bedbound for a day. I didn't need painkillers, but had to keep the grounding sheet wrapped around my belly all day and night, and kept drinking angelica tea as well. It was 24th October when the menses started, which was the 28th day of the cycle again, as before. The menses lasted for five days. It seems that the juice fasting and possibly the live water had the most beneficial effect on reducing my menstrual cramps and pain. It thought before that it might have been copper detox, but since that is a long-term gradual process, it doesn't make sense that the menstruation would first suddenly get better and then suddenly worse again. If the copper detox was causing these benefits, you would expect the benefits to increase over time. Also, all this makes me think about the Chinese Medicine experience. I asked the Chinese Doctor how long it would take to heal my menstrual pains and she said maybe six months if I took the supplements she gave me regularly. I couldn't and still can't afford that, plus the regular appointment fee, so I thought I would try another route. And funnily enough, it seems to be a much cheaper and more efficient route! I find it very hard to believe because I have a lot of respect for the Chinese medicine. However, I have to conclude that when it comes to healing menstrual pain, juice fasting and live spring water seem to be much more affordable and effective methods - at least in my experience. Of course everyone's body is different. This makes me feel even stronger than before that there are cheap and simple home cures for many things which are not widely known because they are not being marketed by anyone. I'm not saying that there aren't many things that Chinese Doctors and nutritionists can help with - there are. But at the same time, there also seem to be home remedies which sometimes work better and are cheaper. I will juice fast again this month to see whether I can eliminate the menstrual cramps again. Note: I have now stopped taking limcomin and paramin, because I have still had slight problems with headaches. I think I will generally need to eliminate all tablet-form supplements, because of the fillers they use. Instead I am taking megadoses of Vitamin C and Niacin, the first one as ascorbic acid powder and the second one in capsules. I have so far - in the last two weeks or so - built up the Vit C dosage to 12-16 grams per day, depending on the day. Niacin I only started taking a few days ago but have built it up to 1500mg per day now (non-flush niacin). I also occasionally do 'spine twist' and every time start getting trauma release shakes in my shoulders and back when I do it. I also exercise half an hour most days in the morning, including muscle exercises, yoga and Five Tibetan Rites.